Puerto Vallarta is seriously picturesque, nestled between palm-covered mountains, a river and an azure sea, full of cobblestone streets and whitewashed houses, and sitting in front of a gorgeous sandy beach. The city has mutated from a sleepy seaside village into an international resort so quickly that it is fashionable to deride its spoilt charms, but it's almost impossible to hold a grudge against its lively beaches, galleries, bars and restaurants. Puerto Vallarta attracts over 2.5 million visitors every year (over half of them from within Mexico), began its urban life as late as 1851, when a family by the name of Sánchez plonked themselves down near the mouth of the Río Cuale. The area was part of the traditional lands of the indigenous people that lived along the coast for many centuries, and was probably was never seen by anyone else until the 16th century, when passing Spanish armadas stocked up on local water and firewood. The Spanish were quite taken with the sheltered harbour and several times considered establishing a colony there, but never got round to doing it. Groups of farmers and fisherfolk, emboldened by the Sánchez land-grab, followed suit, and within 35 years there were enough people living in the area to seriously entertain the idea of giving the settlement a name. The town's first official incarnation was as Las Peñas. 1918: 'Puerto Vallarta' was cobbled together from puerto (port) and the name of a former state governor, Ignacio Luis Vallarta. 1954: Mexico's main domestic airline began to realise the tourist potential of what was a beautiful village in a pristine bayside location, and started flights to a dusty runway in what's now the centre of Puerto Vallarta, in an area originally named after the peasant revolutionary Emiliano Zapata. At that stage, in 1963, Puerto Vallarta had a population of only 2000 people. The real turning point in the development of the local tourist industry came almost a decade later, when a film director John Huston decided to shoot his adaptation of Tennessee Williams' The Night of the Iguana in the nearby cove of Mismaloya. All of this ensured that Puerto Vallarta became the place for Americans to come for some tropical romance. Once the film crew had left, the tour groups loaded with starry-eyed honeymooners started to arrive. The international press quickly dropped their interest in the creative efforts of gifted director Huston and a crew that included famous Mexican cinematographer Gabriel Figueroa, and descended on Puerto Vallarta to expose the secret romance between lead actor Richard Burton and Elizabeth Taylor. While they were at it, they also wrote lots of low-minded prose about co-star Ava Gardner. 1968: it used the influx of visitors and investors generated by all the overblown publicity to lobby successfully to become a designated Mexican 'city', and then began building highway links south along the coast to Barra de Navidad and north to Compostela, with a new international airport thrown in for good measure. 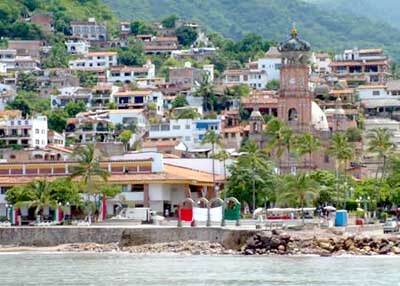 In the decade from 1980, the permanent population of central Puerto Vallarta doubled to over 100,000. The resort-city gets 2.5 million visitors annually, 1.5 million of whom are Mexicans. Puerto Vallarta has since gone on to become one of Mexico's premier international beach resorts, commanding as much tourist-brochure space as other Pacific playgrounds like Acapulco, Mazatlán and Zihuatanejo-Ixtapa.